Day 03:Kathmandu to Heatuda Take a drive along the old highway connecting Kathmandu to the rest of Nepal before the Tribhuvan Raj Margha road was built to Life Cycle Farm House at Hetauda. We have the option to stop at the hill crest and cycle down into the Teri, mostly on paved highway. At the bottom we can then cut off the road and cross the river following a nice jungle section to Life Cycle. Overnight at hotel. Day 04:Heatuda Single Tracks Heatuda has plenty of trails for mountain bikers. 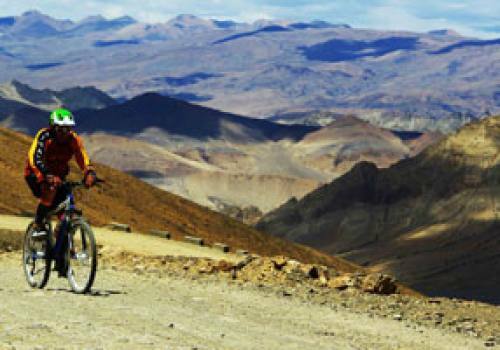 Free riding through the Churiya Hills is a must do activity. We head for the ride after breakfast to meet with unending single tracks, jeep tracks, technical trails and some nice up and downhill’s. 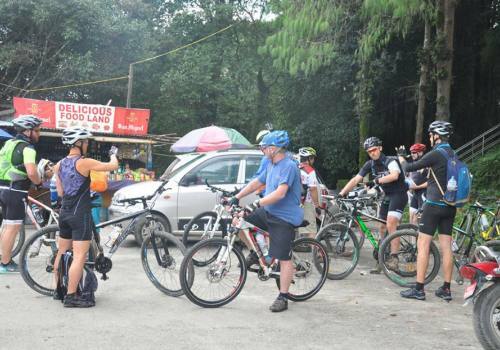 This ride is not just trail riding but a chance to meet the local people, witness village life, local culture and much more. 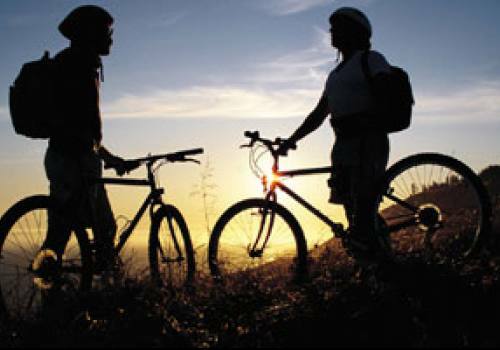 A great day out and the distance entirely depends on how far you want to ride. Overnight at hotel. Day 05:Heatuda to Chitwan We leave the hotel morning and drive most of the way to Chitwan, stopping in Sauhara we then have some lunch and take in the river side vibe. From here we and ride along the river for two and a half hours to a place called Jagat. A long the way we explore the 20,000 lakes and get many chances to see wildlife and birdlife. Stay overnight at Jungle Villa Resort a beautiful and peaceful place to hang out and enjoy the jungle environment, relax and rest. Listen to the peaceful sounds of birds and the gentle flow of the river as the sun goes down. Day 06:Chitwan Jungle Safari A morning ride takes us down along the river to the border of India. 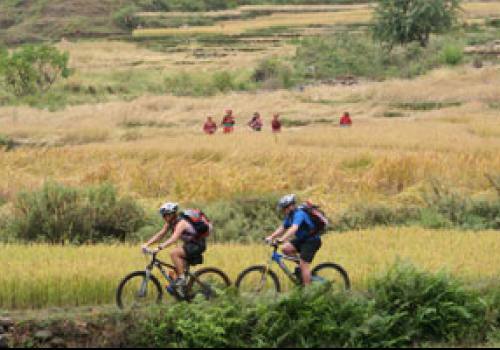 Here you can see the difference in the village culture and scenery as our trail follows the Rapti River. Return to the resort for lunch followed by some time to rest and relax. Late afternoon venture deep into the jungle on elephant back on your quest for wildlife. Overnight at hotel. Day 07:Chitwan to Pokhara Transfer by support vehicle to Pokhara. Have an afternoon of rest or exploring Pokhara Lakeside. Pokhara is famous for its beautiful Fewa Lake, relaxed atmosphere and stunning mountain views. Overnight at hotel. 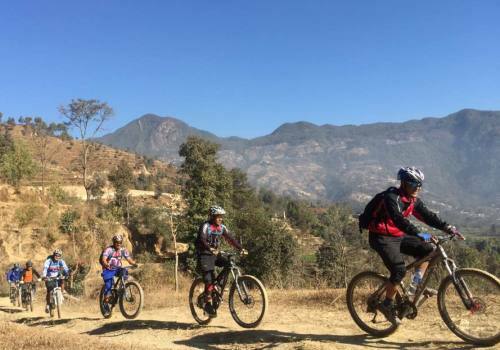 Day 08:Pokhara – Round the Lake Day Trip A great day’s ride around Fewa Tal in Pokhara. 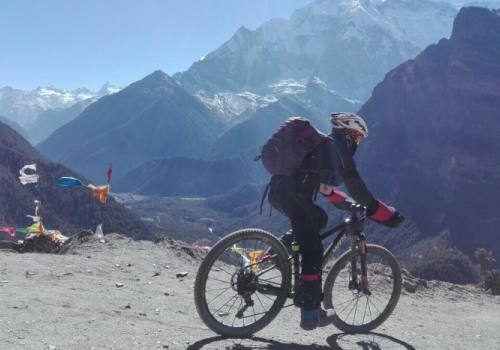 The ride takes around 4 hours and there are awesome views of the Himalaya along the way, which is a good reward for a tough climb. Afternoon is free to explore Lake Side and prepare for the next step of our journey. Overnight at hotel. Day 09:Pokhara to Kagbeni – Riding Distance 14km. Altitude 2800m Wake up for sunrise and hopefully catch a glimpse of the mountains before we head to the airport. It’s about a 22 min flight to Jomsom, above the Pokhara valley and deep into the heart of the Himalaya, take a peek out of the window for fantastic views of Dhawalagiri and beyond. The flight is simply breathtaking as the plane’s wingtips almost touch the snow capped peaks, fly right between the Himalayan giants and you feel your adventure has really begun as the small plane banks left and touches down in Jomsom. In Jomsom, we have breakfast and spend some time getting the bikes ready for the journey. 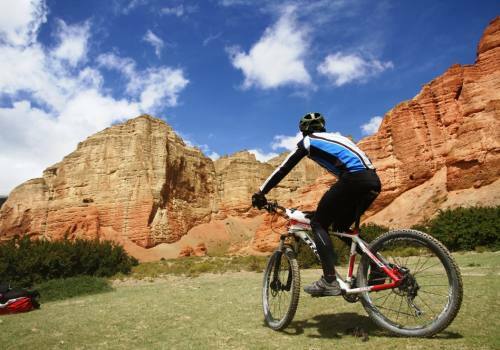 Enjoy an easy acclimatization ride of 14km to the beautiful Tibetan village of Kagbeni. The road is mostly flat and traces the Kaligandaki River right up to the boundary of Upper Mustang. Overnight at hotel. Day 10:Kagbeni to Muktinath – Riding Distance 18km. Altitude 3760 meters Early morning we can see the sunrise and have breakfast. Today we cycle uphill for the most part. Leaving behind the beautiful village of Kagbeni, warm up your legs and start to climb. We follow the trail on the north side of the gorge and climb up on a dusty jeep track towards the foreboding Throng La Pass. We stop and explore the ancient monastery at Jhong and have some lunch basking in the sunshine and enjoying the mountain Views. The final push after lunch is short and we should arrive in Muktinath in the mid afternoon. Overnight at hotel. Day 11:Muktinath to Tukuche– Riding Distance 32 km. Altitude 2560 meters Our day kicks off with some brilliant downhill and after yesterdays challenge, you will welcome fun jeep tracks and trails with a mostly downhill gradient! We have to start early as the wind gets up after 11 am making riding a bit more challenging. Chill out on this section and enjoy the views. For experienced riders there are single track options. 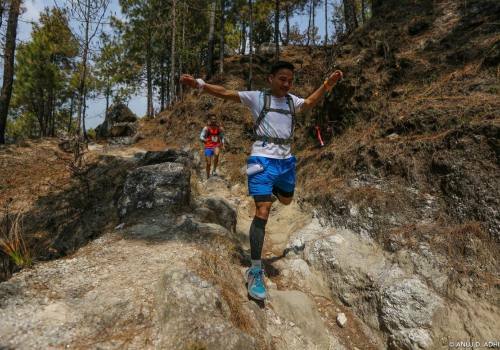 Savor the moment as you whizz past trekkers, the Himalayan wind in your face and miles of downhill before your wheels. 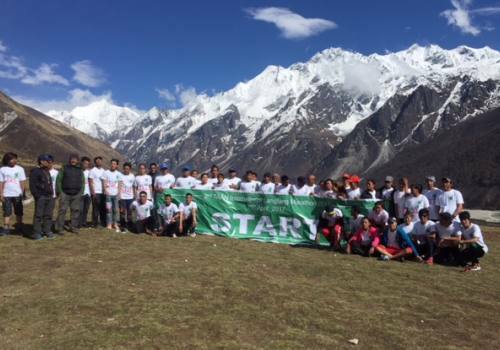 Once in the river Valley it’s a 6km flat stretch to Jomsom followed by undulating trails along the river to Marpha. In the wind this can be a bit tough riding, but stop and enjoy the views along the way. Take lunch in the beautiful and ancient town of Marpha famous for growing apples and making apple brandy! Overnight at hotel. Day 12:Tukuche to Tatopani– Riding Distance 36 km. Altitude 1190 meters The trail starts out gentle and flat and winds in and out of the valley sides, through pine forests and small villages. Following the river, there are good views of the snow capped peaks. Stop at the lush waterfalls at Rukse Chaahara for lunch. After here the speed picks up as the trail drops some 1000 meters with sweeping curves and plunges, rocky sections and bumps that you will love. Arrive in Tatopani the cobble lined village famous for its rejuvenating Hot Springs. Overnight at hotel. 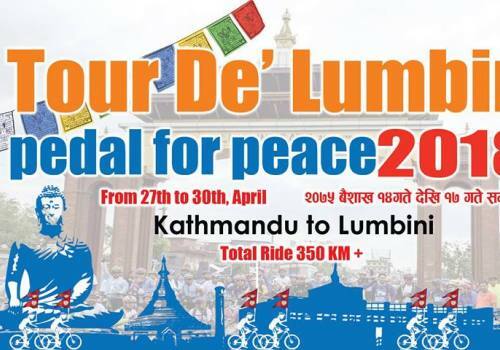 Day 13:Tatapani to Maldunda and Back to Pokhara– Riding Distance 22km. A ride of around 45 km on open jeep track, flat for the most part but a few up and down hills. From Maldundha we transfer by jeep back to Pokhara for a well earned rest. Overnight at hotel. Day 15:Manakamana to Kathmandu Leave mid morning and head back to Kathmandu, about a 4 hours drive. Time in the afternoon for shopping and sightseeing. Overnight at hotel.